Heat some oil in a pan and put the prawns in. Do not allow them to cook through, just mix them around gently till the shells just begin to change colour. Remove and place in a separate dish. Add a little more oil to the pan and put in the crushed garlic. Fry until it begins to colour slightly, then add the onions and green chillis, followed by the curry leaves. Cook until the onions soften and just begin to brown. Add the ground coconut and sauté until the mixture begins to look dry and the coconut begins to release its oil. Add the turmeric, coriander, and the ground roasted cumin and mustard. Cook for about a minute, then add salt and two cups of hot water. Add the tamarind paste or kudampuli. Simmer for about 10 minutes, then add the prawns to the broth and cook on low heat until done – not more than 2-3 minutes! Serve with steamed rice and wedges of lime or lemon. 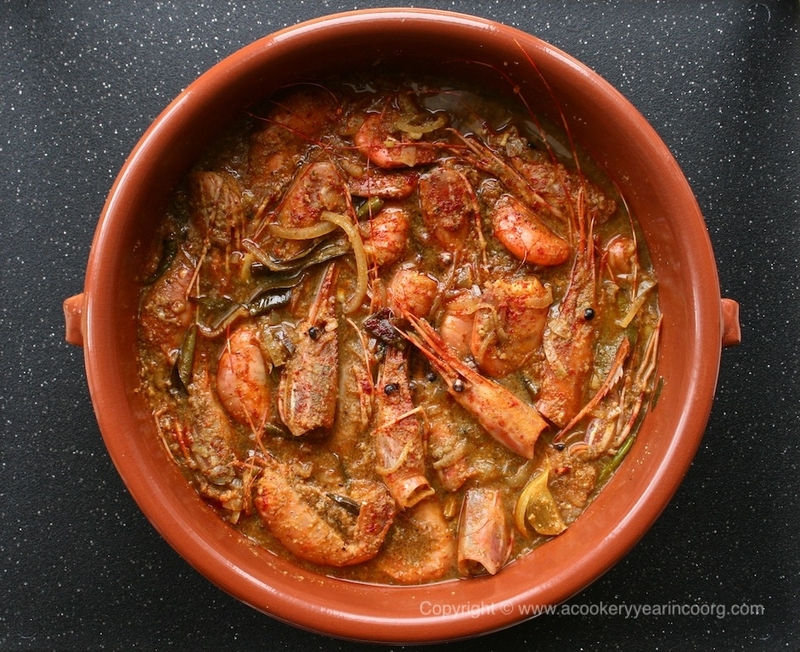 *For a Coorg fish curry, you would add a few drops of kachampuli before finishing, but in this instance, I prefer to use pieces of kudampuli. If you don’t have any, just serve the curry up with lemon or lime wedges.